Yoga and relaxation are extremely beneficial during pregnancy and beyond. They provide support by keeping the body strong and the mind clear and focused. These practices can also aid recovery and provide many valuable tools that you can draw on once your baby is here. Prenatal Yoga offers a safe, practical, effective, and supportive forty-five-minute class specifically created for moms-to-be. 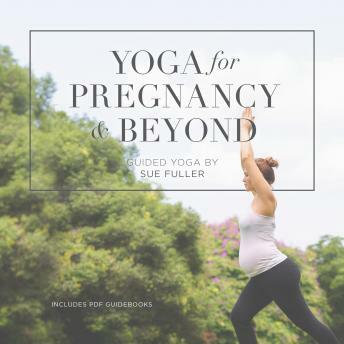 It can be used during the entire pregnancy and is suitable for those with and without previous yoga experience. Prenatal Relaxation consists of two twenty-minute relaxation sessions that are suitable for use during pregnancy and the first stage of labor. Both sessions feature carefully selected yoga breathing exercises (pranayamas) combined with simple and effective visualization and muscle relaxation techniques that have been specifically chosen to deeply relax the body and mind. Postnatal Yoga consists of two different safe, effective, and practical thirty-minute instructional yoga classes with a strong focus on alignment and floor based postures. The classes have been devised for use after pregnancy and are suitable for women with and without previous yoga experience. Please do not listen to this audio while driving.